Christmastime in New York is an experience. I suppose the same could be said for most seasons and/or holidays here, though summer is decidedly less pleasant. This weekend, instead of heading up to Boston for a quiet weekend away before the holidays, we stayed in town and did Christmas in New York things. We admired the lights strung on fire escapes, glittering high above the streets, scouted trees at the corner stands, and consumed holiday themed coffees and treats. Then to complete the experience, we did something we haven't done in years, we got on a train uptown and went to see the tree in Rockefeller Centre. We knew that it would be insanely crowded and difficult to navigate the area with so many people. Even with the police directing traffic, there was a line to cross the street. 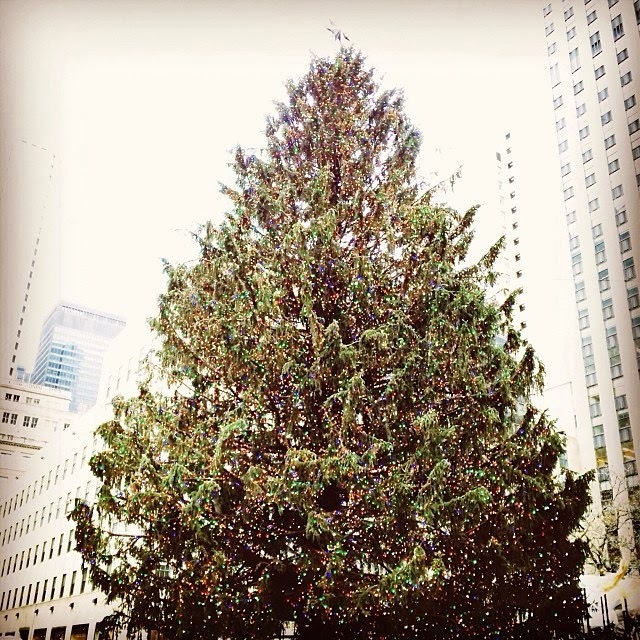 Eventually, we made our way past the street vendors selling roasted chestnuts, cold weather accessories, and New York themed trinkets and found a non crowded spot against 30 Rock where we could stop and breathe and snap a photo of the tree. You know, for proof. We sipped our Christmas coffees that were by this point cold and watched people pose for pictures in front of the tree. It takes much longer than it used to, posing for photos in the age of digital cameras. I'm dating myself here, but I remember having to smile and hope it came out good because it was film and you couldn't see if you blinked mid shot or were making a weird face and your mom wasn't about to take forty-five of the same shot until your hair looked good. As a blogger, I am guilty of this of course, but I still find it funny, sad, and interesting. After the tree we slowly made our way to the East Village to catch a few friends do a really great improv show, followed by a visit to JD's office and eventually ended our day with hot chocolate and pfeffernüsse cookies. It was a good weekend.